I think this is really good school. The material represents more challenge and is closer to the real test. The classes are very good. They are totally focused to obtain better score in the test. IELTS is an English exam that tests your knowledge of academic and general English. IELTS has four different sections: listening, reading, writing and speaking. IELTS is jointly managed by the British Council, IDP: IELTS Australia, and the University of Cambridge ESOL Examinations. The maximum score on IELTS is band 9, but even native speakers are unlikely to achieve this score. Most students try to score between band 6 and band 7. At Higher Score® at LSC Language Studies Canada our goal is to help every IELTS student achieve a band score of 6.5 to 7.5, depending on their need. IELTS has two versions: academic and general. The academic version, of course, is useful for entering university in Canada or other countries like the UK, the USA and Austalia. The general version of IELTS is mainly for people who want to improve their general English or become a permanent resident of Canada, the UK or Australia. 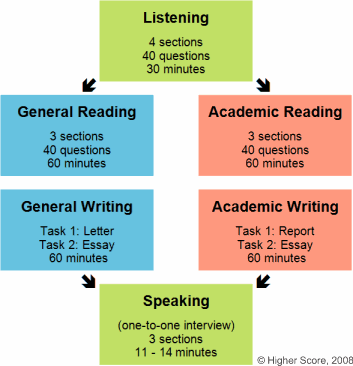 Academic and General IELTS have the same listening and speaking sections, but the reading and writing sections are different. The general reading section has shorter reading passages than the academic exam, but the question types are the same. The general writing section includes writing a letter and an essay; the academic writing section includes writing a report and an essay. The Higher Score® IELTS course practices both academic and general IELTS, but mainly focuses on academic IELTS because it is more useful for everyone. Both versions of IELTS can be challenging, and many students find it hard to achieve the score they need. The good news is that Higher Score® teachers can help you learn exam thinking, which will give you a big advantage during the test and help you after you enter university or become a permanent resident of Canada or another country. If you want to register for IELTS in Canada, you should visit this website to download an application form and read the application instructions. Make sure you read the application instructions carefully and follow them exactly so that you don't make a mistake with your registration. If you want to register for IELTS in another country, visit this website and choose your country from the list. Then follow the links to find out how to register in your country.